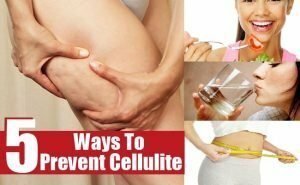 How to get rid of cellulite at home? What should I do to prevent the appearance of an “orange peel” and to fight it correctly? About all the secrets of the most common female “disease” you are offered to read in this article. For the first time cellulitis was spoken about in the middle of the last century in New York, when the owner of one of the many beauty salons, Nicole Rosner offered ladies a very useful service. In 1973, her article on cellulite appeared in Vogue, making a lot of noise and forcing thousands of women to think about how to get rid of cellulite on the belly, the buttocks and hips. At the initial stages, the problem is really not dangerous, and is not even noticeable. However, if a micro-nodule appears on the skin and the tissues become swollen, the woman begins to experience real discomfort. The fourth stage of the disease is already marked with cyanotic tissue, to which blood and nutrients do not flow, and require medical care because of the risk of their dystrophy. That’s why it is necessary to do your best when you notice the first signs of the cellulitis. Here you are going to find many effective ways to get rid of cellulitis. Choose the one that suits you best. High-calorie, heat-treated products form harmful substances after digestion. They are not always completely excreted from the body, especially with reduced metabolism. In this case, they find themselves in adipose tissue, contributing to its growth on the hips, buttocks and abdomen. Fasting for more than three days without a doctor’s supervision is not recommended, as a sudden change in weight is a stress for the body. To get rid of cellulite, you can shortly reduce the calorie intake below the body’s needs. The body starts using the energy of the remains of not digested food, to expend fat mass, to destroy “substandard” cells and tissues. The main condition is to prevent the use of healthy tissues. What must an anti-cellulite diet include? In the diet it is useful to include low-fat beef, chicken, veal, fish as it helps to keep moisture in the skin. Bilberry contributes to the early recovery of collagen fibers. Pineapples are useful, they effectively break down fatty deposits. It is necessary to include in the diet raisins, dried apricots. A lot of vitamins and trace elements are in a persimmon. 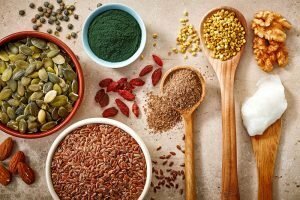 In oats, millet, barley, bran there is a lot of fiber and vegetable protein. Rough fiber effectively cleanses the intestines from harmful substances. Sour-milk products are useful: kefir, yoghurt without additives, cottage cheese, fermented baked milk. They are useful to use them with fruit. In small amounts, nuts and seeds are useful, they contain fiber and potassium cells. In order to prevent and combat cellulite, it is necessary to include seaweed, algae in the diet. Seafood strengthens collagen fibers, which slows the development of cosmetic problems. It is useful to eat carrots and foods rich in vitamin A. This vitamin is important for the development of cells, increases resistance to carcinogens. Vitamin A can be found in fish oil, egg yolks, fruits and vegetables of red color. To get rid of cellulite it is possible with the vitamins of group B: B1 normalizes the metabolic processes, which is especially important for excess weight and fatty deposits of different nature. Its a lot in bran and yeast. B2 is important for oxidation-reduction reactions, growth and development processes. It is contained in yeast. B3 improves the health of the skin, important for the synthesis of proteins and fats. B12 participates in the exchange reactions. Vitamin C is involved in the synthesis of protein, should be present in the daily diet. In addition to lemons and oranges, vitamin C is in rosehip, black currant. Vitamin D is involved in carbohydrate metabolism, reactions involving magnesium, iron, calcium, phosphorus. Contained in eggs, liver of fish. Vitamin E (tocopherol) is important for the function of the thyroid gland, the production of vitamin A. It is found in green vegetables, cereal germs, vegetable oils. Vitamins A, C, E effectively fight free radicals. To normalize metabolic processes, it is worth including in the diet products rich in potassium and sodium. Potassium is found in bananas, oranges, watermelons, baked potatoes, legumes, nuts, raisins, spinach, peaches. The main source of sodium is sodium chloride. In the fight against cellulite it is useful to consume foods rich in phosphorus. It is a part of cells, participates in metabolic processes of fats, proteins and vitamins. Contained in cheese, egg yolks, legumes, fish. Important: It is necessary to exclude from the diet sugar, milk, all kinds of canned or processed foods. Coffee is acceptable in moderate doses, since it stimulates metabolic reactions. At excessive use of coffee worsens the blood supply of tissues. The use of anti-cellulite cream is effective in the initial stage of the fight against cellulite. Otherwise, the treatment will not work. If the skin in the problem area is oily, it is better to choose an anti-cellulite gel. It is made from a mixture of water and alcohol, which dries the skin. It speeds up metabolic processes and blood circulation. In addition, the composition includes components that increase the elasticity of blood vessels, exfoliating agents, collagen. Components based on caffeine contribute to the breakdown of fats. Excess of stored fat is removed through the bloodstream. Algae solve a slightly different problem, preventing the formation of fat. Ivy extract is particularly effective in eliminating excess fluid. Horse chestnut strengthens blood vessels, preventing penetration of fluid to the tissues. Some anti-cellulite remedies are good for removing swelling. But the effect of dehydration will be short-lived if you do not perform the appropriate physical exercises. Important: To get rid of the first signs of cellulite, it is enough to apply a small amount of cream or gel, rubbing it with smooth rounded movements. Having absorbed, it will have a therapeutic effect. For smoothing and leveling the problem areas on the legs, buttocks, abdomen, it is recommended to use 2table spoons of apple cider vinegar diluted with a similar amount of warm water. Add 3 drops of essential oil of rosemary. Moisten the composition with the skin, cover with a film and woolen blanket. After 30 minutes, rinse, treat the skin with a moisturizer. 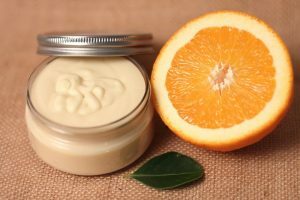 Acquire clay in the pharmacy, dilute it with warm mineral or boiled water to gruel, add 3-5 drops of essential oil of orange. Apply to damaged areas, cover with a film and wrap it with a wool blanket. After half an hour, rinse, apply moisturizer. The procedure is applied every other day. Mix the coffee grounds with 1 teaspoon of the blue clay (sold in a pharmacy), add mineral water to the formation of sour cream consistency. Apply mask on moistened skin for 10 minutes, rinse with warm water. After a few minutes, wash it off. The procedure is carried out 2-3 times a week for two months. Coffee grounds are mixed with 1 tsp. honey and rubbed into the problem areas of the skin. After wrapping the body with a film, take cover with a blanket and wait half an hour. The composition is washed off with warm boiled water. Its effect persists for a while, so do not take a bath for 2-3 hours. Important: The coffee body wrap is contraindicated in case you have varicose veins. Slightly tucking the thumb and index finger on the skin, move the crease. Initially, the pressure and compression of the fingers should be minimal. As the tissues warm up, gradually increase the effort. Having dug the fold of the skin with the thumb and forefinger, pull it back and twist it slightly clockwise, then unclench the fingers. After this massage, the skin should gently blister. It is useful to stroke in a direction from below-upwards, slightly to pat. Small tweaks are performed without twisting over the entire area affected by the defect area. In the case of hardened skin, pressure is helpful. Rounded movements are performed by the knuckles of the brush and alternate strokes. Rubbing with considerable force is performed either along the circumference, or by describing the letter “S”, the direction is still bottom-up. This movement is best done on dry skin, squeezing the brush into a fist or using a brush, a towel. Finish doing massage with light pats of the palms. Finally, the body is recommended to gently and gently pat. To enhance the therapeutic effect of the massage procedure should be performed with the use of anti-cellulite composition, prepared at home. Recipe: mix 1/2 cup kefir and 1 tbsp. Add 5 drops of rosemary essential oil and rub it during the massage after taking a bath. Home massage procedure, to get rid of cellulite, is performed every other day for 20-30 minutes. The effect appears in about two weeks. Honey for the treatment of cellulite is used inside or outside. It is important that the product does not cause allergies. When ingested, honey removes excess fluid, prevents the formation of salts. Remove cellulite on the buttocks, thighs with honey massage. It is better to do it in the evening, every other day. The effect of treating cellulite manifests itself in about two weeks. The skin becomes supple, smooth, velvety. honey; Orange and lemon oils 2 drops per 1 tsp honey; Lavender, orange, juniper, lemon oil – 1 drop per 1 tsp. honey; Lavender and lemon – 1 drop, mint – 3 drops for 1 tsp. honey; honey is applied on the palms and performs soft patting movements, gradually increasing the force of pressure and lifting the palm from the skin more sharply. When the tissues warm up, the technique changes: rather strongly press the palms to the body, then sharply peel off. During the massage procedure honey turns into white mass. Pressing and detaching movements are performed up to 15 minutes. At the end, the sweet mass is washed off with warm water using a soft sponge without detergents, a moisturizer is applied. In some cases, bruises may appear on the skin, especially after the first sessions. In due course they will pass. The first sessions are rather painful, but gradually the discomfort decreases. Important: After the massage it is useful to apply a mask, do wraps with various products based on seaweed, chocolate. Masks and wraps will improve the skin condition, increase the inflow of nutrients to the deepest layers of it and help get rid of the cosmetic defect faster. 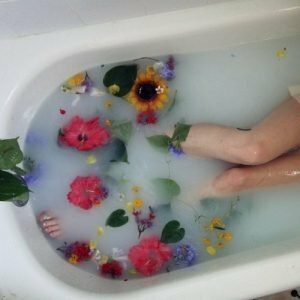 Anti-cellulite baths help to get rid of cellulite. For their preparation you should use 3-4 tbs. of sea salt dissolved in warm water at a temperature of +37 + 38C. A mixture of 300 grams of herbs: lavender, rosemary, horsetail, marjoram, ivy, oregano, thyme, sage. Cellulite treatment lasts up to 15 minutes not more than twice a week. After rinse under a cool shower, wipe off, rubbing the problem areas with a towel, put on a warm bathrobe and drink a couple of cups of hot tea. Important: After half an hour, have a shower once again to rinse off the salt. Apply anti-cellulite cream. With a sedentary lifestyle in the region of the hips and buttocks, the fluid that stretches the tissue accumulates. Long-term vessels clogged violate optimal blood circulation. In the absence of preventive measures after a while, you have to think about some or other ways to get rid of cellulite. Fight with cellulite with exercises to strengthen the dorsal muscles and the acquisition of proper posture. Skipping rope using different jumping techniques on both, and on each leg alternately. Squats. The feet are shoulder width apart and parallel to each other. On inhalation the brushes rise up, legs bend. On exhalation the body rises, knees retain a parallel position. Wide squats help to fight cellulite. Squat to the level of the chair seat or slightly lower, on the inspiration down, on the exhalation up. Walking in place, lifting your knees high. Exercise “bicycle”. Lying on the back, hands along the trunk, pedaling the bicycle for 3-5 minutes. Standing on your knees and elbows, straighten each leg in turn, maximally protruding the heel, the toe remains on the rug. Important: When performing exercises, it is better to breathe not with the stomach, but with the lungs. Each is performed up to 8-12 times, every other day. The first results are visible after 15-20 lessons. To cleanse the body of harmful substances, reduce body weight, get rid of cellulite, it is useful to prepare the following vegetable mixes. Leave it for an hour and drain. Take one glass in the morning and evening. A month later, make a week-long break. Mix in equal parts chamomile flowers, lime blossom, mint leaves, fennel fruits, black elderberries. Brew at the rate of one part of the mixture for 20 parts of boiling water. Sustain on a water bath of 15 minutes, let it cool down and filter. Take 1 glass 2-3 times a day during two months. Besides the mentioned recipe you can use the root of dill as it has a diuretic property and effectively removes harmful substances from the body, normalizes the functioning of the endocrine glands. Birch helps to get rid of cellulite as well as it eliminates excess moisture in the tissues, removing harmful substances from the joints and clots of fat under the skin on the hips and buttocks. Important: Natural remedies are more effective in the combination of other anti-cellulite remedies. Do not smoke. Smoking destroys vitamin C, responsible for the proper metabolism and elasticity of the skin. Drink 1.5 liters of water per day. This amount of fluid should enter the body except tea, juices and other beverages. It will ensure the removal of excess fluid and toxins from the body. Eat healthy food. This is one of the main recommendations. Less flour and sweet, more whole grains, fruits and vegetables. Do sports, but better perform special exercises against cellulite on the buttocks and thighs. Do not be nervous, since stress causes disturbances in metabolic processes and leads to the formation of an “orange peel”. Also, do not worry about how to get rid of cellulite during pregnancy. The reason for its occurrence is hormonal changes in the body. When your baby is born, it is likely that cellulite will disappear. ← How to get rid of unwanted body hair effectively? Cellulitis is a BACTERIAL INFECTION under the skin. Please do not add to the disinformation overload already clogging the Web.